How often do you find yourself wishing you had access to a single, comprehensive reference resource delivering expert knowledge and best practices on safety issues to help you make better informed decisions and analysis? If you find yourself in this situation, then, “The Fleet Safety Library” is the perfect reference tool you have been looking for! Brought to you by DRIVING DYNAMICS, North America’s preferred provider of corporate driver safety training and fleet risk management, this valuable, online resource tool can be the first place you look whenever you need answers to everyday questions on a broad range of safety topics plus risk management, governmental compliance as well as general business practices. Don’t guess … be sure! This is your opportunity to be the fleet safety subject matter expert in your organization. 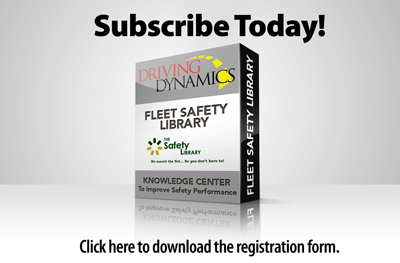 The Fleet Safety Library, with over 30 Categories and close to 1,000 Reference Resources, is a secure, online service that contains dozens of topic sections, hundreds and hundreds of fleet safety reference items all at your finger tips. Now we can help you make timely, informed decisions as our subject matter experts are constantly searching and updating your Library with new content to make sure you have the latest thinking for whatever subject you are working on. Do you have an interest in this timely and important topic? Would a white paper be of interest to you? It’s available in our Library along with dozens of other related topics! As Your Information Needs Grows … We’re Right There With You! Our librarians take the time to dig deep to find those materials that are hard to find … then keep track of them as they are reworked and updated. Not only do we continuously search the internet for new material, we also eliminate outdated material to make sure you have the most current resources available. Frankly, our subscribers just don’t have the time to do this for research for themselves. 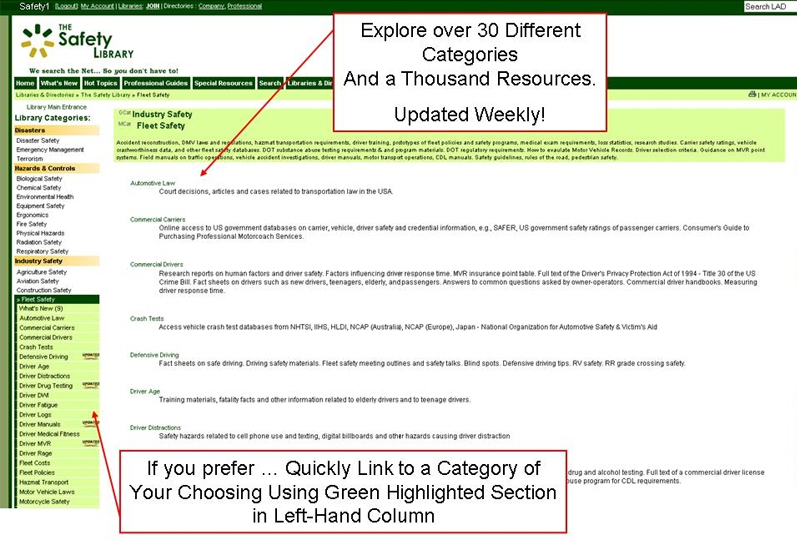 Instantly … dozens of topic sections, hundreds and hundreds of reference items all at your finger tips. Let us help you make timely, informed decisions as we are constantly searching and updating our Library with new content to make sure you have the latest thinking for whatever subject you are working on. If you are serious about controlling fleet related safety costs; keeping your drivers safe; and understanding regulatory requirements affecting corporate fleet operations; then we urge you to start your subscription today. Please review the information on our Subscription Form for the various subscription options available to you; make your selection; and submit your application. Don’t delay … start today!